In the run-up to their appearance in Age of Ultron, much hubbub was made over the true origins of Pietro and Wanda Maximoff. At first the comics cast doubt on Magneto’s parentage of the mutant twins, and then Marvel’s own movie altered their origin once more. And now, it’s been retconned again. Yup, it turns out that the twin’s parents were always Django and Marya Maximoff — but instead of being born mutants thanks to parentage from Magneto, they were instead failed experiments of the High Evolutionary (a being obsessed with genetically perfecting the human race beyond their current form, after giving himself superhuman intelligence and abilities through genetic experimentation). The experiments conducted by the High Evolutionary gave Wanda and Pietro their powers, but they were then returned to their parents to be raised as believing they were ordinary mutants instead. So what does this really do to Scarlet Witch and Quicksilver? Well, nothing. 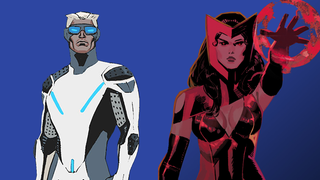 They’re still superheroes, still members of the Avengers (or at least, their “Uncanny” branch). But as many have speculated, it does serve as a bit off cross-company wrangling between Fox and Marvel for the movie rights of the comic company’s mutant characters. By denying that the characters ever were mutants, it disparage’s Fox’s own interpretation of Quicksilver from Days of Future Past, while “legitimizing” the origins of the MCU’s take on the characters as they take their place in the Marvel movies beyond Age of Ultron. But is it really Marvel attempting to spite their cinematic competition? Or just retconning for the sake of retconning? In the crazy, often silly world of comics, sometimes it’s genuinely hard to tell.